Is Riding Between Lanes on a Motorcycle Safe? Of course, riding a motorcycle always comes with a degree of danger. You can’t control what other drivers will do — and you can’t always predict the stupidity or negligence of others. 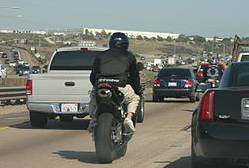 But from personal experience, both as a life-long biker, and as a motorcycle accident attorney, I believe that lane splitting is safe, if it’s done safely — that is, at reasonable speeds for the given situation, and only by an experienced rider. The simple fact is, many bikers zip through traffic as though the notion of getting cut-off by an inattentive driver is ridiculous. This is a recipe for disaster. I’ve handled far too many motorcycle accident lawsuits that result from drivers jumping across a double-yellow and cutting off a lane-splitting biker. In most (but not all) of these cases, the motorcyclist was riding way too fast — either too fast for the situation, or sometimes even far in excess of the posted speed limit. And often, these bikers have been inexperienced riders, having ridden a motorcycle for less than a year or two. If you chose to split lanes, please do so safely. Traffic in California can be treacherous. Just take a ride around the mean streets of Los Angeles, San Diego, or San Francisco (where I was hit by an uninsured driver ten years ago), and look into cars at the drivers. It seems like half of them are texting or talking on their phone without a headset. And who knows how many have been drinking? The fact that “it was the other guy’s fault” won’t put you back together if you’re badly injured in an accident. We’re expert motorcycle accident lawyers, and we’re happy to help you if you are in an accident. But we were motorcyclists long before we were attorneys, and we mean it when we say, we would rather you never need us. Ride safe.